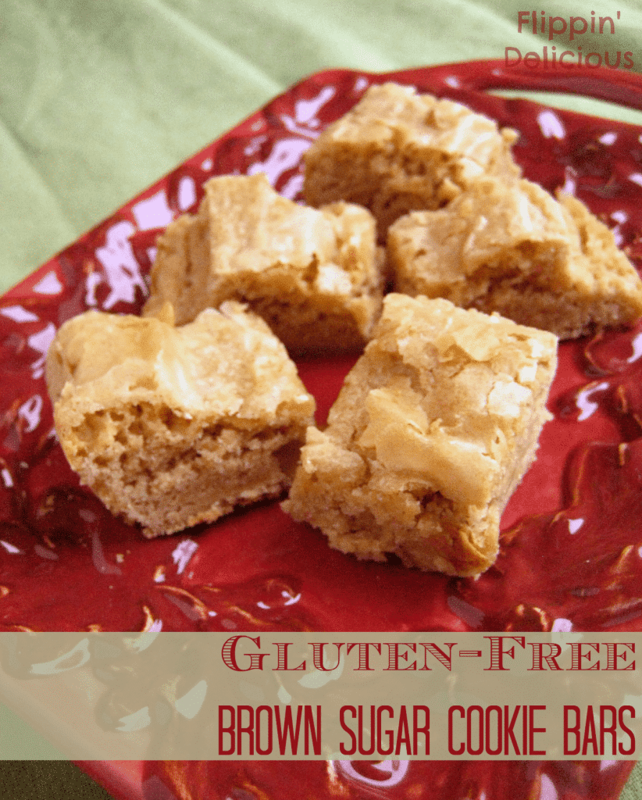 Gluten free Brown Sugar Cookie Bars are chewy, golden, and sweet. Who likes to bake cookies? I really think that cookies have become my go-to treat, I actually do bake them almost every day. I’m always testing new recipes! There is a reason that I currently have a sore throat and runny nose and Miss E has a hacking cough. 🙁 That reason is cookies. But we love them so much! I just went 6 days without baking cookies, which really is a miracle in our house. Cookies go hand in hand with the holidays, so Merry Christmas! 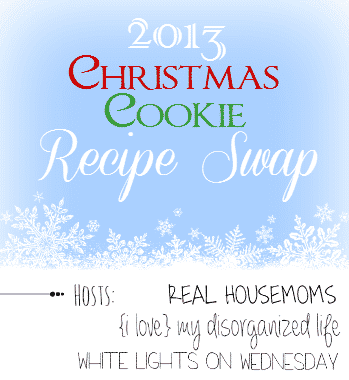 I’m really excited to participate in the 2013 Christmas Cookie Recipe Swap sponsored by White Lights on Wednesday, I Love My Disorganized Life, and Real Housemoms. 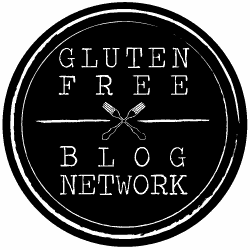 I was paired up with Jaime of Mom’s Test Kitchen, so today she is sharing one of my favorite recipes from last year, and I’m sharing one of hers. Not to brag, but it isn’t often that I have baking fails. Especially if I’m baking cookies. I feel like I pretty much have cookies down. But bars still give me issues every once in a while. Normally I only have to make small changes. The cookie will be pretty close to what I want it to be, and if I make changes they are only very slight. This recipe I had to make 3 times. For whatever reason the conversion just gave me a lot of problems. At first I made it just like the original recipe. The batter looked, smelled (and tasted) amazing! I threw it in the oven and forgot about it for 20 minutes. When I came back it was foaming up almost over the edges of the pan. I baked it longer to try and get it to set up, but it didn’t. I finally pulled it out and it immediately sunk. 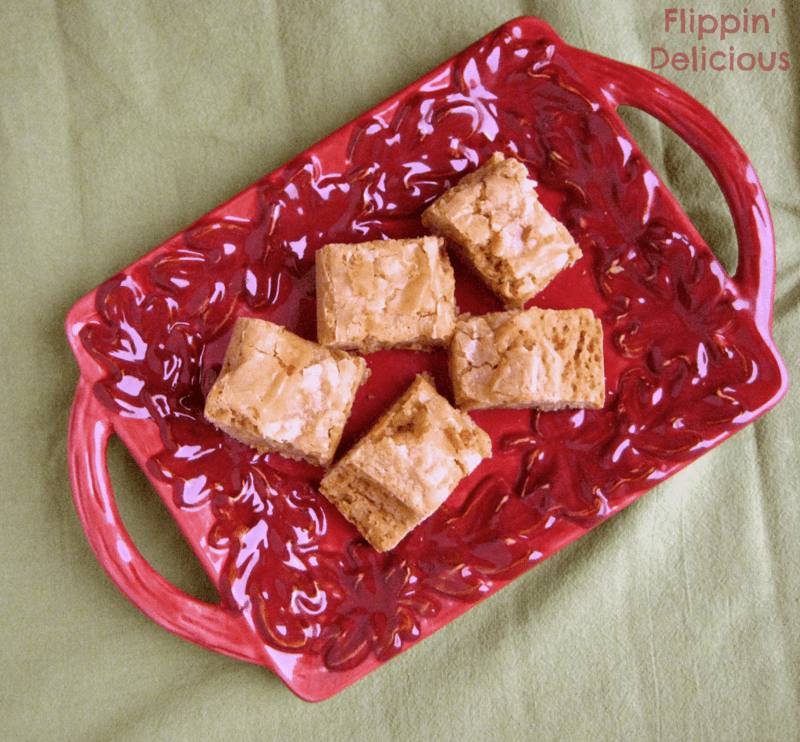 I ended up with a super flat pan of sticky caramel that had a slight floury taste. My were they good, but it wasn’t what I was looking for. Try #2 I doubled the flour and eggs and I ended up with a cake. Not what I was going for either. Try #3 I finally got it right. 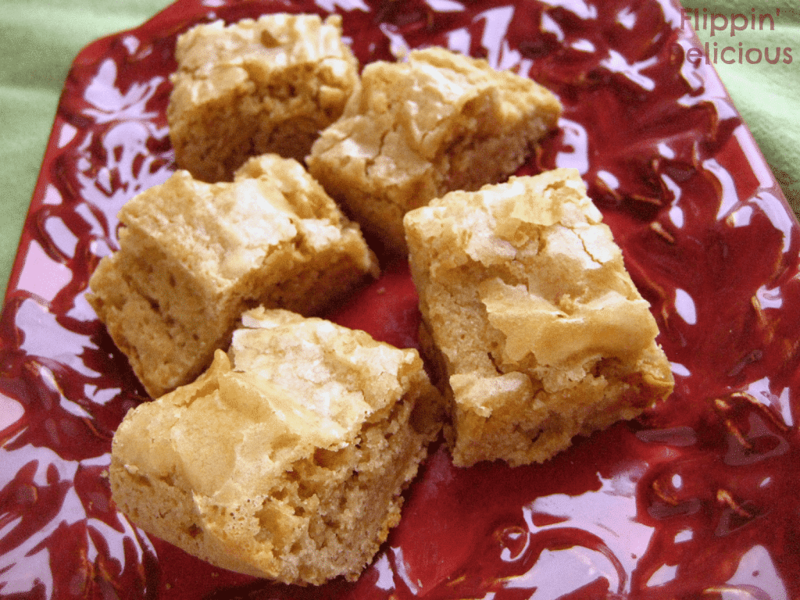 Sweet, chewy, and with that little flaky layer right on the top. The results were exactly what I was hoping for and all my effort (and the 2 pans of cookie bars I ate my hubby’s coworker’s ate) were totally worth it. So enjoy the fruit cookies, of my labor. You don’t have to make 3 pans, unless you want to. Also, check out Jaime’s version of my White Chocolate Cherry Kaleidoscope cookies! In a small saucepan, melt the butter. Turn off the heat, add the brown sugar and stir until smooth. Stir in the rice flour blend. Add the vanilla and almond, and stir to combine. Pour the batter into the prepared pan and bake for 25-30 minutes. 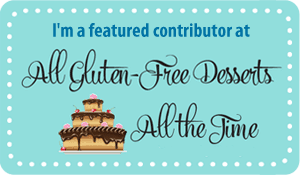 The Jaime’s recipe from Mom’s Test Kitchen wasn’t gluten-free. Please check out her version here. I do live at high altitude so hopefully that wasn’t the reason that this particular recipe gave me problems. Please let me know in the comments how this recipe works for you, and where you are baking. I had the same problems when I first tried to convert my favorite blondie recipe. I gave up on that one, but maybe I’ll tackle it again. The original recipes had melted butter and baking powder in common. I omitted the bp in this version so hopefully that was all the problem was. So what is the leavening in this recipe? Baking soda, baking powder? This recipe actually doesn’t need either baking powder or baking soda. The eggs are all the leavening it needs.